It was nothing if not obvious, but the anonymous member of the press who first gave Frank Tyson his wonderful alliterative soubriquet “The Typhoon”, provided cricket history with its finest epithet since the Australian journalist Hugh Buggy first came up with the word “bodyline”. Tyson’s record is simply phenomenal. No other post war bowler with more than 75 wickets in Tests can get close to the price the Typhoon paid for his 76, just 18.56 each. Only Waqar Younis, Shane Bond and Dale Steyn have better strike rates. Lancastrian by birth, Tyson was denied a future with his home county by a conspiracy of circumstances. He impressed well enough in the Old Trafford nets but when it came to his first match for the second eleven, in the Minor Counties Championship against Northumberland in 1949, he was late due to industrial action on the railways, and then broke down with a pulled muscle after five wicketless overs. The county, perhaps understandably, did not pursue their interest in the 19 year old National Serviceman. Had they done so, and been able to partner the Typhoon with the Greyhound (Brian Statham) throughout the 1950s, then the years of hurt would surely never have extended to as many as 77. His Army service over Tyson, nobody’s fool, took up a Scholarship at Durham University. In order to supplement his meagre income he played as a league professional in the cricket season, and while plying his trade in the North Staffordshire League he was introduced to Northamptonshire, who offered him a two year contract in 1952 which he gratefully accepted. Tyson could not appear in the County Championship until he had seen out a twelve month residential qualification period and his only First Class appearance in his first year was against the touring Indians. He bowled his first over in First Class cricket at Test player Pankaj Roy. His first delivery caught the edge of Roy’s bat and flew to slip. The snick was far too fast for teammate Freddie Jakeman and it cannoned into his knee. The resultant delay while Jakeman recovered no doubt served only to further unsettle the Indian opener, who must have been horrified at finding an English bowler even quicker than Freddie Trueman, who had already terrorised the touring batsmen in the first three Tests of that summer’s series. Justice was done with the final ball of that Tyson over when another opportunity in the slips was held – this time they were stood five yards further back. Roy’s wicket was Tyson’s only one in the ten Indian wickets that fell in the drawn encounter, and the rest of his spell was somewhat wayward, although he went for only just over two runs per over. Tyson’s captain at Northamptonshire was the old-fashioned amateur, Freddie Brown. Two decades prior to Tyson’s debut Brown had been the junior member of Douglas Jardine’s 1932/33 England party and his comment, that he had not seen a faster over than Tyson’s since Larwood on that famous tour, is a telling one, particularly as the pitch at Northampton was noted as being anything but a sympathetic surface for fast bowlers. For his second First Class appearance Tyson faced the following year’s tourists, Lindsay Hassett’s Australians. Again the first over was sensational. In his 2009 autobiography Colin McDonald describes the famous run up that began just in front of the sightscreen, followed by a blur that left both he and the slip cordon rooted to the spot as the ball took the edge of his bat and flashed to the boundary. The second delivery cannoned into his pads and he was given out lbw. The next batsman, Graeme Hole, was treated to a bouncer first up that flew past his face. Hole, who employed an unusually high backlift, was comprehensively yorked by the fourth delivery as he failed to bring his bat down quickly enough. Thereafter Tyson was, again, unpredictable and he took no further wickets nor, as the county lost by an innings, did he get another opportunity with the new ball. After that match, his residential qualification duly acquired, Tyson gained a regular berth in the Northants first team and played in 13 matches altogether. He only took 26 wickets, but he was nursed through the season, averaging less than 20 overs per game, and his wickets came at the reasonable cost of 25.80 each. Word was getting round the counties, and Northants visit to Old Trafford in mid-August was to add to the legend. It was not a good wicket, Lancashire were in the running for the title and wanted a result. They were not too worried about the Northants attack generally, nor the local man they had previously rejected in particular. Northants won a famous victory by one wicket, and Tyson is remembered for two things. The first is bowling one short-pitched delivery that rose up over wicketkeeper Keith Andrew’s head and bounced just once before thudding into the sightscreen. The other is the way he started the Lancashire second innings with three quick wickets. It really should have been four, but Geoffrey Edrich was reprieved three times before going on, despite carrying a hand injury that was aggravated by Tyson’s thunderbolts, to an unbeaten 81 in typically courageous fashion that almost salvaged the game for the Red Rose. The first full season for Frank Tyson was 1954, the year that the new nation of Pakistan first toured England. In mid July he made his first appearance at Lord’s in a First Class match, against Middlesex. The England selectors were all there and Tyson’s duel with the senior member of the Edrich clan, Bill, seems to have been the catalyst for his name finding its way on to the list of those invited to tour Australia that winter that was announced two weeks later. The Lord’s wicket was a quick one, and the famous old ridge made Tyson’s deliveries fly. When, towards the end of the second day, Edrich arrived at the crease the light was beginning to fade. In good batting conditions Tyson was a terrifying proposition to most, and these were anything but good but for former Squadron Leader Edrich DFC the battle with the young tyro was one he relished. The first ball the great man received was a short one that he sought to hook, but succeeded only in top edging into his face. The result was a great deal of blood on the wicket, a broken cheekbone, and even a man as brave as Bill Edrich needed to leave the field for hospital treatment. The Middlesex skipper was back on the ground next morning with his face disfigured by swelling and swathed in bandages. Teammates and umpires alike begged him not to bat again but if he was listening he certainly didn’t heed their pleas . The Typhoon greeted him with another bouncer, again Edrich tried and failed to hook, on this occasion the ball hitting him over the heart. Some might have baulked at dishing out another dose out to an injured man but not Tyson, and Edrich certainly expected no special treatment. Had Fred Trueman not, by his antics in the Caribbean in 1953/54, made himself persona non grata with the selectors it must have been almost certain to be him and not Tyson who made that Australian trip under Hutton to defend the Ashes in 1954/55. As it was though there was a space for an express bowler and after that match at Lord’s the Typhoon was the man who filled it. Not surprisingly he was quickly slotted into an experimental England side for the final Test against Pakistan. That historic encounter was won by the tourists but, in a low scoring match, Tyson opened his account with five inexpensive wickets. It was clear from the off that Australia were going to have to put up with a pace battery such as had not been seen in the country since 1932/33. Jardine’s men had won 4-1, but had made one or two mistakes along the way and Hutton repeated one at the Gabba in the first Test when he picked four pace bowlers and no spinner. He compounded that by putting Australia in and, fourteen dropped catches and 601 runs later, Ian Johnson declared and a comfortable innings victory for Australia followed. Tyson’s 1-160 were the worst figures of his career. Much was to be made of an incident that occurred in the second Test involving Lindwall and Tyson and the seeds were sown here. Lindwall contributed an unbeaten 64 to his side’s total and, ignoring convention, a frustrated Tyson bounced him. The second Test at the SCG was greeted by heavy rain and the surface gave assistance to the bowlers. Johnson, undaunted by Hutton’s mistake at the Gabba, asked England to bat and dismissed them for 154. Australia replied with 228, Lindwall caught by Godfrey Evans behind the wicket from a Tyson bumper – that was twice the fast bowler’s time-honoured agreement had been breached, and Lindwall was counting. There were four wickets for Tyson who, after his bitter experience in the first Test, had cut down his run-up in order to conserve energy. The best part of forty yards became less than twenty. He lost nothing in speed. Although his batsmen came to regret it Lindwall, unsurprisingly given recent events, bounced Tyson back in the England second innings. Tyson, not without ability as a batsman but very inexperienced, turned his back on the delivery and was struck on the head and, barely conscious, taken to hospital where an x-ray confirmed there was no lasting damage. Hutton wrote later When he came out of his concussed state I swear there was a new light in his eyes ….. when he resumed bowling the next day he was a yard, maybe a yard and a half, faster than before. A furious Tyson was, initially, rather too wild as Australia, seeking 223 to win, closed at 72-2 overnight. Next morning an equally angry, but much more calculating Tyson returned to the fray, and shattered the stumps of Jimmy Burke and Hole with just five added. The die was cast and England went on to win by 38 runs, Tyson 6-85 for the innings, and his first ever ten wicket match haul. Moving to Melbourne at one Test all the pattern of the third Test was similar to that of the second. In compiling a disappointing 191 England were reliant on a remarkably composed 102 from Colin Cowdrey, who had celebrated his 22nd birthday only a week earlier. As in their first innings at Sydney no Australian managed a half century, but there were contributions all the way down the order and a first innings lead of 40. It was Statham’s turn to shine as he took five wickets, as opposed to just two for the Typhoon. England were again indebted to one man in particular in their second innings. This time it was Peter May who scored 91, and Australia were set 240 for victory. Once more there was a promising start and the home side closed at 75-2 on the fourth evening. Next day however they were never in it and collapsed in a heap for just 111 Tyson, having a remarkable day, taking 7-27. The Typhoon was always something of a blunt instrument. He relied on sheer pace for his effectiveness and had little by way of finesse, but that morning he found some swing to go with the speed and the Australians never had a chance. The history books go on to tell us that England won the fourth Test at Adelaide as well. There was no leading role for Tyson this time, and indeed no single matchwinning performance for England, but there were three wickets in each innings for the Typhoon. Only the rain in Sydney prevented a 4-1 win for England. The first three days were blank. When there was finally some play England got to 371 before declaring and later they were able to enforce the follow on. Sadly for England there was insufficent time left in the match and Australia had four wickets intact when the game ended. Another session would have done it as at that point the hosts were still 32 behind. Tyson got a couple of wickets in the first innings but, if England were going to force a victory, it was going to be the left arm spin of Johnny Wardle that secured it. The Typhoon was only called upon to bowl five overs in that second innings, and even then Hutton asked him to bowl off six paces in order to speed up the over rate – he was still quick enough to knock Keith Miller’s bat from his hands. Tyson’s final tally for the series, 28 wickets at 20, after such an inauspicious start, remains one of the great Ashes performances, but he never played more than two Tests in a series again. There were injuries in 1955 and 1956, and those restricted him to two Tests against the 1955 South Africans and one against the 1956 Australians. He toured South Africa in the winter of 1956/57 but had to retire with tonsilitis after bowling just nine overs in the first Test. He did not regain his place until the fifth and final Test when, with match figures of 8-78 he showed what he was capable of. It did not help that the selectors had such an embarassment of riches at the time. Statham, Trueman, Peter Loader and Alan Moss were vying for the pace bowling places and Jim Laker, Tony Lock and Wardle were three world class spinners. A poor start to the 1957 County Championship campaign meant that Tyson had no opportunities against the disappointing West Indians of 1957, nor indeed the very weak New Zealanders and Indians of 1958 and 1959, whose batting travails did much for the career figures of Statham and Trueman. 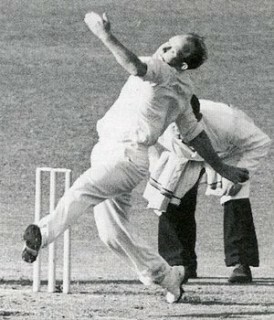 The final Tests of Frank Tyson’s career came on the 1958/59 tour to Australia. Memories of the havoc wreaked four years earlier, coupled with the fact that at 28 there was no reason to believe that the Typhoon could not blow again, got him into the squad. The series was a disaster for England, both on and off the field. It was the fourth Test before Tyson found his way into the Test side but although in that, and the final Test, he bowled reasonably well, the Australians had the upper hand and his three wickets cost him 193 runs. In New Zealand he played his final two Tests. There were some inexpensive wickets but the writing was on the wall when, in the second Test, New Zealand’s last man, Ken Hough, struck him for five boundaries in what were to prove his last two overs in Test cricket. Back in England in 1959 and 1960 Tyson did not bowl badly, but the deterioration was sufficient for him to decide that, aged just 30, the time had come to retire. Once the raw pace was gone the lack of an ability to consistently swing or seam the ball, or make subtle changes of pace, drew Tyson’s sting. His offer to remain on the coaching staff at Northampton was rejected so he went off to Todmorden in the Lancashire League for the 1961 summer before, in December of that year, following in the footsteps of his hero Harold Larwood and emigrating to the country where he had made his name. Tyson worked in teaching and coaching and became a popular broadcaster and writer. Not surprisingly at 81 he is now fully retired, but still active, and living on the Gold Coast. So where is Tyson in the speed gallery? His career peak was, realistically, just one Australian summer, so it is impossible to even begin to compare him with the all time greats as far as overall quality is concerned. But where is he in terms of sheer pace? He was tested once by, whatever it may mean, bowling into a radio beam projected down the pitch. The experiment took place in New Zealand in 1955, and came up with 89 mph, well down on the 100s recorded by Brett Lee and Shoaib Akhtar in recent years. Yet the comparison is futile. No one can now know how the technologies compare, and we do know that it was such a cold day in Wellington when Tyson was tested that he kept his two sweaters on throughout the trial, and he was not completely confident of his footholds. Shortly after he retired Don Bradman expressed the view that, one over from Eddie Gilbert apart, Larwood was the fastest bowler he had seen. He later changed his view after seeing Tyson in 1954/55. Bradman was, of course, perfectly positioned to judge Larwood, but not Tyson. To show how futile such comparisons can be one just has to look at the views of another perfectly positioned observer of Larwood, bodyline umpire George Hele, who took a contrary view to Bradman. Besides his first county captain Brown who, as noted, felt that Tyson in 1952 at Northampton bore favourable comparison with Larwood in Australia two decades before, there was one Test match cricketer who played with Larwood, and against Tyson and therefore saw them both at close quarters, Joe Hardstaff. There is probably limited value in Hardstaff’s views however as he reckoned Larwood to be two or three yards better than him, the him in question being West Indian Wesley Hall, who he had earlier acknowledged as being fast, real fast. Hardstaff did not mention Tyson. Rose-tinted spectacles are almost always going to get in the way of this particular debate. As the question cannot be resolved I will end the Typhoon’s story with a couple of quotes. The first is from the press box in 1954/55, from Neville Cardus Tyson went into action with the aspect of a whirlwind motion of destructive energy, regardless of restraint, regardless of physical rupture, broken shoulder-blades or burst buttons and bootlaces. He made a fearsome sight, his forehead gleaming in the sun as he bent his head before charging like a bull at a gate. And the last words go to fellow speedster Miller, again writing during that famous series Australia’s batsmen were left in no doubt that they were facing the fastest and most menacing bowler in the world, a bowler who was a trier to the last ounce of his great energy and a fighter to the bottom of his gigantic heart. The menace that was Tyson caught the imagination of the people of Australia as a bush-fire catches the forests of the parched Mt. Lofty Ranges during a South Australian heatwave. Another great article from Sir frederick on one of the more interestng chaps to have bowled quickly for the mother country. I’ve always been tickled by the incongruity between FHT’s unthreatening physical appearance (looking every inch the balding, bespectacled teacher he became in later life) and his raw pace and compromising hostility. &, as if being immortalised by the gilded fertang fountain pen wasn’t honour enough, he also shares the honour with those two little pals of mine in having [URL=”http://www.youtube.com/watch?v=Ieaxt-ukFzs”]a calypso[/URL] composed in his honour. Enjoyed that. Nothing quite like reading about fast bowlers for me. Entertaining read. First cricket book I read was A Typhoon Called Tyson, one of my dad\’s. Always had a soft spot for him, particularly when I learned of his teaching affiliation with Colin Milburn. Speaking of averages, his second-innings average was a phenonenal 9.58! I’ve read some first-rate stuff here. Certainly worth bookmarking for revisiting.